Greetings from Shanghai where the pace of life is slowly returning to normal after the Chinese New Year festivities, which kicked off on February 16th. I’ve long enjoyed CNY celebrations in cities around the world. However, the experience of my first Spring Festival in Shanghai is one I will not soon forget. The 15-day festival is the most important holiday on China’s cultural and retail calendars. For reference, it's interesting to know that Chinese families spent close to $100B on CNY shopping and dining in 2014– almost double what was spent during American Thanksgiving. Among other things, I observed the festival to be a study in contrasts. On the one hand, there is a strong cultural imperative to return home for a traditional celebration with family members. I still have a hard time wrapping my head around the fact that homeward-bound Chinese travelers make almost 3 billion trips annually during the New Year celebration, creating the world’s largest human migration. However, the idea of duonian, or “escaping” from the Spring Festival is also gaining popularity throughout China. Growing numbers of urban professionals enjoy escaping the mainland for international vacations, while migrant workers are increasingly forgoing trips home to skip the financial burden of the gifts expected to accompany their arrival. Travel home or escape? Cook a traditional meal or dine out? Shop at customary markets or online? Give time-honored gifts or foreign goods? Or even an English couplet? The interplay between 4,000 years of tradition and a decidedly modern lifestyle was at play throughout CNY preparations and celebrations this year. At many points during the festival, I encountered people expressing aspects of this duality – a deep yearning to honor tradition mixed with a desire to infuse their holiday celebrations with contemporary goods and experiences. I also observed several companies actively helping Chinese consumers reconcile this cultural tension. They represent great examples of how a brand can deepen their relationship with consumers during moments that matter, by answering unmet needs and desires with delightful solutions. I’d be remiss not to start with WeChat’s reinvention of the hongbao, or cash-filled red envelope customarily exchanged during CNY celebrations. In 2014, the company launched a Red Envelope App, which allowed users to digitally participate in the customary gifting. 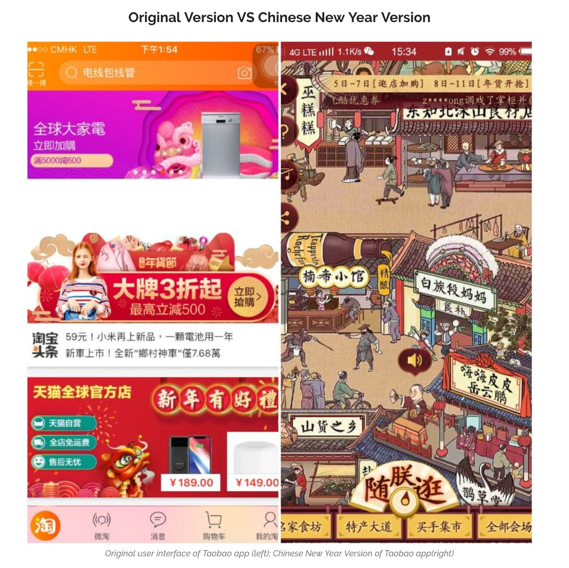 WeChat drew on the traditional iconography of the red packet, so the app felt familiar and rooted in tradition. However, a novel innovation allowed gifters to send a lump sum to a group to be dispersed in random amounts, adding a new element of surprise and luck. 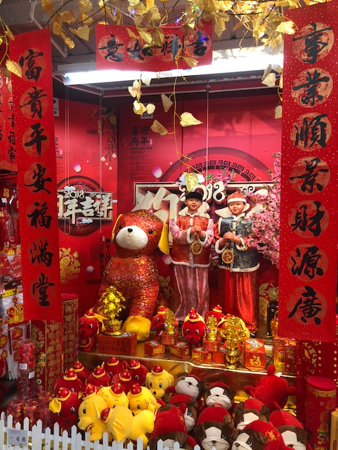 Chinese New Year preparations customarily include family shopping trips to local markets to buy fabric for new clothing, décor items, gifts, candies, and the ingredients for holiday meals. Today, consumer goods are abundant throughout the year, families live further apart, and shopping trips are rapidly shifting to hypermarkets and online. Yet, many still yearn for the time-honored market experience. Last year, the eCommerce website Taobao acknowledged this tension with a beautiful redesign of their user interface for the CNY holiday. The seasonal overlay drew inspiration from a famous, Song-dynasty era painting of a traditional Chinese market, Along the River During the Qingming Festival. Taobao created an animated, interactive interpretation of the art that became their homepage during the festival. Users could shop the animation, either by clicking parts of the picture corresponding to what they wanted to purchase or by using a search feature. This creative website redesign was an insightful solution to help shoppers reconcile a longing for the traditional market trip with the ease and convenience of accomplishing their holiday shopping online. During the festival, there is no shortage of nostalgic advertising that explores the increasing difficulty of pausing one’s busy life to return home. (See here, here, and here, but have your tissues ready). This year, Nokia did something less expected with their holiday advertising, which launched the Nokia 6 just ahead of the CNY. The campaign features a dutiful son who is a busy actor, unable to return home for the New Year. His mother, unsatisfied with a video call, surprises him on the set of his film with a home-cooked meal, and the pair enjoy a warm dinner together. I love the way that Nokia suggests an unexpected solution to a common consumer dilemma, by reimagining the idea of the “return home” and opening up new paths to family togetherness. This year’s production, Thunderbolt Parents, is a musical comedy that tells the story of two generations of love and dreams. It sagely reminds “young people” across generations that we will find our parents much cooler (and more complicated) than we imagine if we only make an effort to understand them. Over the past 7 years, Pepsi’s launch of a short film has become a CNY tradition in its own right, signaling to consumers that the Spring Festival is near. This year’s project has already garnered over 600 million views, along with a noteworthy amount of social media buzz. I appreciate the way that Pepsi, true to its fun-loving spirit, uses a star-studded cast and karaoke-worthy tunes to refresh the idea of the traditional reunion dinner. Pepsi joyfully reminds consumers that, with a little heart, celebrating the New Year with family can be a lively, modern affair. These examples are four sparks that illuminate how an insightful blend of the customary and the contemporary can result in a delightful updating of tradition. Rapid technological innovation and increasing prosperity are contributing to moments of cultural change in cities around the globe. This is certainly true in China during the Spring Festival and at other times throughout the year as well. I believe brands, especially multinationals, are at their best when they can help consumers forge new ways forward while also helping them retain what is important from the past. The most successful will approach this opportunity with the perfect blend of fresh thinking and humility – a mandate that will be at the core of my work in the year ahead.